By a vote of 95 to one – with Sen. Bernie Sanders, I-Vt., the lone “no” vote – the U.S. Senate confirmed Nicole Nason (seen above) to be the next administrator of the Federal Highway Administration. Nominated by President Trump on Jan. 3 to lead the FHWA, Nason noted in her confirmation testimony that she plans to place particular emphasis on beefing up rural road safety. “My priority is safety on all roads, but we must recognize and address some of the unique safety challenges faced by rural communities,” she explained in her testimony before Senate Committee on Environment and Public Works on January 29. 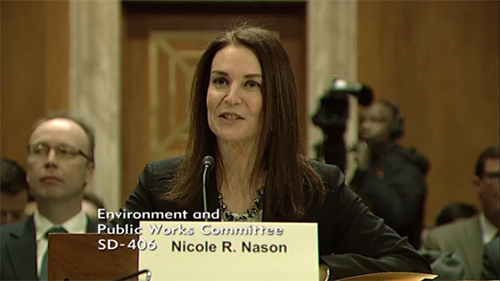 Jim Tymon, executive director of the American Association of State Highway and Transportation Officials, welcomed Nason’s confirmation as FHWA Administrator and looks forward to working with her.